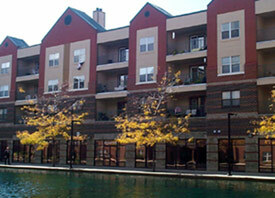 The ISMA headquarters is located in downtown Indianapolis on the canal level of the Canal Square Apartment building (To enter the parking garage, turn onto Vermont Street from West Street. New York Street is the exit only). The ISMA has 50 free parking spaces in the lower level of the covered parking garage, just outside the ISMA entrance, for the convenience of ISMA members and visitors. Parking for events or seminars hosted at the ISMA should be addressed in your meeting notice. Follow the signs to the lower level and push the button at the gate to speak to our receptionist. Vehicles not parked in designated ISMA parking spaces may be towed at the owner's expense. Turn left on Vermont Street, then turn right into the black gate. Enter 12 on the keypad to ring the receptionist. Follow I-69 S. as it becomes SR-37 and then Fall Creek Blvd. Turn left (south) onto Meridian St. Follow Meridian St. (U.S. 31) south to Michigan St. (one way, westbound), turn right. Turn left on West Street. Turn left on Vermont Street (1 block after Michigan St. and before New York St.), then turn right into the black gate. Enter 12 on the keypad to ring the receptionist. Take U.S. 31 (Meridian St.) south to Michigan St. (one way, westbound), turn right. Turn left on West Street. Turn left on Vermont Street (1 block after Michigan St. and before New York St.), then turn right into the black gate. Enter 12 on the keypad to ring the receptionist. Take I-65 S. to the West St. exit. Follow West St. south to Vermont St. (1 block after Michigan St. and before New York St.) and turn left. Take I-65 N. to I-70 W. to the West St. exit. Go north (Missouri becomes West) to Vermont St.
(1 block after New York St. and before Michigan St.). Turn right on Vermont Street, then turn right into the black gate. Enter 12 on the keypad to ring the receptionist. Take I-70 E. to West St. Exit. Go north (Missouri St. becomes West St.) to Vermont Street (1 block after New York St. and before Michigan St.).